OF THE U. S., AND THE STATE OF OHIO. Col. WM. A. TRIMBLE, major of the 26th U. S. infantry; brevetted in 1814 as colonel of the 8th U. S. infantry. CARY A. TRIMBLE, brevetted in 1814 as captain of first rifle regiment, U. S. Army. One volunteer rifle company, enlisted and mustered into service by Capt. Geo. W. Barrere, of New Market, and William Davidson as lieutenant. One volunteer infantry company, enlisted and mustered into service by John Jones, of Hillsboro, as captain, and James Patterson as lieutenant. UNDER THE GENERAL CALL OF 1813. One regiment of infantry, enlisted and called into service by Wm. Keys, of Hillsboro, O., as colonel, and Allen Trimble as major, James Daniel as adjutant, Dr. Jasper Hand as sergeant, and Augustus Richards as sergeant's mate; consisting, in part of the following companies from Highland county, enlisted and mustered into service by the following officers: Capt. John Jones, Capt. James Patterson, Capt. Hugh Rogers, Capt. Joel Berryman. The lieutenants' names can not be ascertained by inquiry among the oldest inhabitants. Infantry company: David Irick, capt. ; Jackson Kennipe, 1st lieutenant, and Samuel D. Stewart, 2d lieutenant. "thought it prudent to send a courier to overtake Lieut. Col. Irwin. A gold mounted sword was voted to him by the Congress of the United States; and he was also promoted to the office of lieutenant in the regular army of the United States. IN THE WAR OF THE REBELLION, A. D. 1861. The term Roster will comprehend the officers of the regiment and company mustered into service from Highland Co.
12th REGIMENT OHIO VOLUNTEER INFANTRY. ROSTER - THREE YEARS' SERVICE. 2d Lieut. Ezra Stevenson June 6, 1861 Aug. 31, 1861 Promoted to 1st Lieut. Captain J. B. Hill June 3, 1861 June 12, 1861 Resigned June, 1862. 1st Lieut. H. N. Easton June 3, 1861 June 12, 1861 Promoted to Captain - Resigned Dec. 20, 1861. 2d Lieut. Birch Foreaker Feb. 8, 1862 Feb. 8, 1862 Promoted to 1st Lieut. Captain Birch Foreaker Apr. 21, 1863 Apr. 21, 1864 Resigned Oct. 1861. 1st Lieut. Dan. W. McCoy May 1, 1863 June 10, 1863 Promoted. 2d Lieut. Ed. Mullinix Aug. 15, 1862 Dec. 30, 1862 Promoted. 1st Lieut. Ed. Mullinix Apr. 21, 1864 Apr. 21, 1864 Mustered out. 27th REGIMENT OHIO VOLUNTEER INFANTRY. Captain Zeph C. Bryan Jun. 27, 1864 Jun. 27, 1864 Died of wound received at the battle of Atlanta. 1st Lieut. Thos. A. Walker Mar. 19, 1864 Mar. 19, 1864 Appointed Major, 69th colored regiment. 1st Lieut. Thos. A. Walker Jul. 16, 18664 Jul. 21, 1864 Promoted to Lieut.-Col., 69th colored regiment. 48th REGIMENT OHIO VOLUNTEER INFANTRY. Colonel J. R. Parker Mar. 18, 1864 Mar. 18, 1864 Mustered out in 1865. 50th REGIMENT OHIO VOLUNTEER INFANTRY. Captain L. C. Guthrie Aug. 16, 1862 Sep. 21, 1862 Mustered out December, 1864. 1st. Lieut. John A. Borum May 24, 1863 Jul. 20, 1863 Resigned. Captain J. J. Manker May 24, 1863 Jul. 20, 1863 Resigned, 1864. Captain C. A. Sheafe Jan. 26, 1862 May 15, 1862 Mustered out. Lieut. F. F. Kibler Jan. 11, 1862 Dec. 31, 1862 Discharged at expiration of term. 60th REGIMENT OHIO VOLUNTEER INFANTRY. RANK NAMES. COUNTY DATE OF RANK DATE OF COM'S'N. 65th REGIMENT OHIO VOLUNTEER INFANTRY. RANK NAME. DATE OF RANK DATE OF COM. REMARKS. 73d REGIMENT OHIO VOLUNTEER INFANTRY. Lieut.-Col. Jacob Hyer Oct. 3, 1861 Jan. 15, 1862 Resigned January, 1862. Captain Silas Irion Dec. 13, 1861 Jan. 15, 1862 Resigned January, 1863. Captain W. H. Eckman Feb. 10, 1865 Feb. 10, 1865 Resigned Feb., 1865. 2d. Lieut. C. W. Trimble Dec. 30, 1861 Jan. 15, 1862 Killed at Bull Run, August 20, 1862. 2d. Lieut Samuel Fellers March 8, 1862 April 14, 1862 Resigned December 24, 1862. 81st REGIMENT OHIO VOLUNTEER INFANTRY. Captain James Gibson July 31, 1862 April 16, 1863 Honorably discharged, November, 1864. 89th REGIMENT OHIO VOLUNTEER INFANTRY. Captain Samuel A. Glenn Jan. 24, 1863 March 30, 1863 Mustered out May 16, 1865. 169th REGIMENT OHIO VOLUNTEER INFANTRY. Captain Joseph Smith May 13, 1864 May 13, 1864 Consolidated with 166th & 167th Ohio Nat. G'ds. 175th REGIMENT OHIO VOLUNTEER INFANTRY. ROSTER - ONE YEAR'S SERVICE. Colonel D. W. McCoy June 6, 1865 June 6, 1865 Mustered out. 1st Lieut. E. E. Mullenix June 6, 1865 June 6, 1865 Mustered out. Surgeon R. E. Duyer Sept. 20, 1864 Sept. 20, 1864 Mustered out. Captain J. M. Heistand Sept. 10, 1864 Sept. 10, 1864 Mustered out. Captain C. W. Appley March 1, 1865 March 21, 1865 Mustered out. 1st Lieut. T. J. McKeehan March 29, 1865 March 29, 1865 Mustered out. 1st Lieut. Samuel S. Jolly June 6, 1865 June 6, 1865 Mustered out with regiment. 2d. Lieut. William M. Barrere Sept. 29, 1864 Sept. 29, 1864 Lost on Sultana. 2d. Lieut. George Sayler June 6, 1865 June 6, 1865 Mustered out. 2d. Lieut. Thomas Elliott March 8, 1865 March 29, 1865 Killed at Franklin, Tennessee. 1st REGIMENT OHIO VOLUNTEER CAVALRY. 1st Lieut. C. A. Doggett Dec. 29, 1861 Oct. 5, 1861 Resigned 1862. 2d. Lieut. David A. Roush Jan. 1, 1863 Jan. 21, 1863 Mustered out. 2d REGIMENT OHIO VOLUNTEER CAVALRY. 4th REGIMENT OHIO VOLUNTEER CAVALRY. 1st Lieut. B. T. Hathaway Dec. 8, 1863 Jan. 21, 1864 Resigned November 3, 1864. 11th REGIMENT OHIO VOLUNTEER CAVALRY. Colonel Wm. O. Collins Dec. 19, 1864 Jan. 28, 1862 Mustered out April 1st, 1865. Captain P. W. Vanwinkle Dec. 21, 1864 Jan. 28, 1862 Mustered out April 1st, 1865. Waives promotion. 1st Lieut. O. S. Glenn Dec. 31, 1861 Jan. 28, 1862 Promoted to Captain. 1st. Lieut W. H. Woodrow Nov. 5, 1861 Jan. 28, 1862 Mustered out as Quartermaster, Nov. 1862. 1st Lieut. Casper W. Collins May 1, 1865 May 1, 1865 Promoted to Captain. Killed at Fort. Casper. 12th REGIMENT OHIO VOLUNTEER CAVALRY. 1st Lieut. Joseph T. Thompson Nov. 12, 1865 Nov. 12, 2865 Mustered out with regiment as 1st Lieut. 1st REGIMENT OHIO VOLUNTEER HEAVY ARTILLERY. 2d REGIMENT OHIO VOLUNTEER HEAVY ARTILLERY. RANK NAME DATE OF RANK DATE OF COM. REMARKS. Captain Samuel Coleman, Company B. Oct. 12, 1864 Oct. 12, 1864 Resigned February 21, 1865. 1st Lieut. Jacob M. Grim, Company A. Jan. 1, 1864 Feb. 8, 1864 Mustered out with regiment. 2d. Lieut. Martin Redkey, Company A. Jan. 1, 1864 Feb. 8, 1864 Resigned March 29th, 1865. 2d. Lieut. James M. Hughey, Company A. Oct. 18, 1864 Oct. 18, 1864 Absent on sick leave, to muster out. Provost Marshals of Highland County. - William Scott and Joseph K. Marley. Wm. R. Smith, Enos Holmes, John H. Jolly and James H. Thompson, of Hillsboro; and Henry L. Dickey, of Greenfield. During the War of the Rebellion, under the act of Congress authorizing a draft, J. K. Marley, of Hillsbory, O., was provost marshal; George B. Gardner, of Hillsboro, O., commissioner; and Dr. David Noble, of Hillsboro, O., surgeon; and they, with E. J. Blount, clerk, constituted the board of enrollment from May, 1863, to April, 1865. "Ohio and the War; her Statesmen, her Generals and Soldiers," by Whitelaw Reed, is believed to be true and accurate as to Highland county. If the names of any officers be omitted, it will not be for want of most diligent search on the part of the author, as to all those officers who participated in the late war; and if it should be thought by some persons that the names of the privates ought also to have been inserted, the compiler would say that it was almost impossible to find the names and places of residence of the private soldiers of each company; and besides this, the insertion of their names, even if known, would make this work too voluminous for any practical purpose. Besides the foregoing regular enlistments on account of the war, there were mustered into the service several other volunteer companies and regiments, for a short time, in defense of the city of Cincinnati, and the town of Ripley, on the Ohio river, which were threatened by the danger of invasion from the opposite side of the river. There were what was called the "Eagle Creek Expedition;" the "Squirrel Hunters," enlisted in defense of Cincinnati; the enlistment of men for the "hundred day's service;" and the most noted of all was the regiment enlisted, armed and equipped for the assistance of General Hobson in pursuit of John Morgan in his raid through the state of Ohio. This regiment united with General Hobson's command, and actively participated in the battle with and capture of John Morgan and his forces at Buffington's island, - and was there, after the battle, disbanded by General Hobson, with high compliments for its efficiency and bravery. Highland county, from its organization kept up and sustained its eclat in the militia system of the state, so long as that system was practically enforced by the laws of the state. But as the practice of that system since the war has become utterly dormant and inefficient, latterly the military spirit of the county, which is always irrepressible, has begun to develop itself in the organization of companies and regiments of infantry and cavalry, called the "Ohio National Guard." In this latter movement, Highland county has been prompt in its assistance, by the organization of one infantry company, called the "Noble Light Guards," in honor of David Noble, of Hillsboro, who by his generosity has contributed largely to its equipment; and by the organization of a cavalry company, called the "Scott Dragoons," in honor of William Scott, of Hillsboro, who has also liberally contributed to its equipment. John Matthews, captain A. W. Moyer, 1st corp. Rob't. S. Woodrow, 1st Lieut. W. C. Woodrow, 2d corp.
B. R. Shipp, 2d lieut. John T. Hire, 3d corp.
Chas. A. Barry, 1st sergt. John A. Reed, Jr., 4th corp.
W. C. Newell, 2d sergt. W. H. Gregg, 5th corp.
Chas. B. Ambrose, 3d sergt. Frank R. Glasscock, 7th corp.
R. T. Hough, color sergt. W. G. Smith, 8th corp.
Wm. Schwartz, captain. Wm. Lemon, 2d corp.
Ed. E. Mullenix, 1st lieut. G. B. Brooksbank, 3d corp.
Ez Steenson, 2d lieut. Louis Wessell, 4th corp.
J. C. Richards, 1st sergt. Emanuel Young, 5th corp.
Josiah Stevenson, 2d sergt. R. G. Cooley, 6th corp.
John L. Duckwall, 3d sergt. Wm. Cooper, 7th corp.
Jas. R. Ferguson, 4th sergt. F. Evans, 8th corp. Some of the officers connected with the above companies are experience military men, having served in the army during the Rebellion, particularly the Colonel of the Regiment, and W. C. Newell. Scott Dragoons; E. E. Mullinix, 1st lieut., and Ez Stevenson, 2d Lieut. And the privates of the companies, being recruited from the best families of the county, are characterized for their gallant bearing as citizen-soldiers, and in personnel, drill and equipment are up to the highest standard of army regulations, and, in the opinion of their friends, on any field of battle, would earn and deserve the highest eclat for valor and death-like daring in the fore-front of the fight. According to an email I received from Patti Anderson: James A. Barr, b. 20 Aug. 1847 in Highland County, Ohio and d. 13 Sept. 1880 in Fairmont, Nebraska. 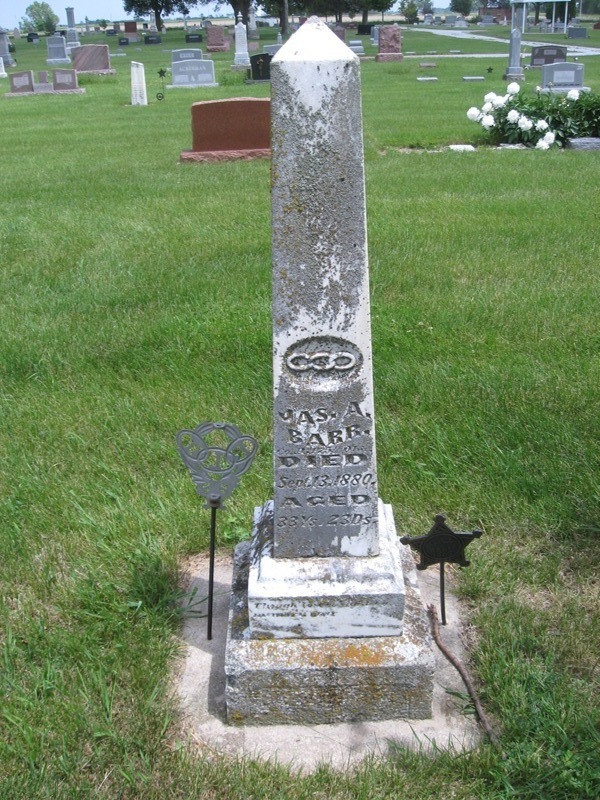 James was a Civil War veteran of Company A, Ohio 175th Infantry regiment on 10 Sept. 1864. He mustered out on 27 June 1865 in Nashville, TN and he was a private. Click small picture to enlarge photo of his headstone.